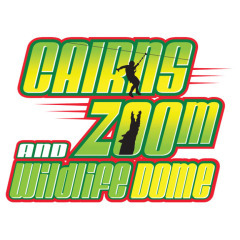 Cairns ZOOM is owned and operated by the CaPTA Group. The CaPTA Group operates highly successful tourist operations in and around Cairns in Far North Queensland. Locally owned and operated by the Woodward Family of Cairns, the name stands for Cairns and Port Trips & Attractions, or more informally, Charlie And Pip's Trips & Attractions. The CaPTA name was launched on Wednesday 19th October 2005 at the Cairns Wildlife Dome atop the Reef Hotel Casino. 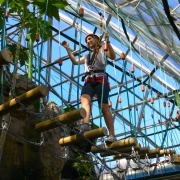 The Cairns ZOOM is the world's first ever Challenge Ropes Course within a wildlife immersion exhibit (an environment where birds and most of the animals can roam free within the confines of the large aviary enclosure, allowing interaction between humans, animals, and the environment). The Cairns Wildlife Dome is a spectacular all-weather exhibit, encased by a 20-metre high glass dome on the rooftop of the prominent Reef Hotel Casino, right in the heart of Cairns. 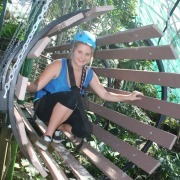 Cairns ZOOm utilises a continuous belay system on the challenge course. All participants will wear a harness which connects them to the safety cable system, which is extremely safe as the customer is not able to disconnect themselves from the course at any time.